Metal parts have the potential to corrode at any stage of the manufacturing, storage or transport process. If corrosion is caught early, the metal part won’t incur damage, but any amount of corrosion causes headaches for your company and your customers. When shipping and storing metal parts, corrosion control is essential. Your company needs the proven rust-prevention methods of VCI packaging to ensure that customers receive pristine parts. Your image and bottom line are at stake. Understanding how corrosion occurs helps companies control it and deliver pristine parts to satisfied customers (i.e., customers looking to order more parts). The corrosion reaction between metals and oxygen is immediate and continuous unless the corrosion cell perpetuating the reaction is stopped. Corrosion on metal is a result of oxidation – a molecular, destructive reaction between oxygen and a metal’s surface. While oxidation does not weaken metal, its surface disintegrates, and a brittle film forms. Rust, however, does weaken metal and is a serious concern. Corrosion inhibitors ensure that your metal parts meet required levels of purity for assembly, processing and shipment for your customer. The technology in VCI Packaging works by creating an invisible molecular layer of corrosion protection on metal surfaces. The corrosion-inhibiting compound migrates from the VCI packaging (paper, poly bag, foam emitter) into the packaging environment, while a thin layer of protection adheres to metal surfaces, reaching into recessed areas, holes, nooks and crannies. Since metal parts are manufactured in different weights, shapes and sizes, metal parts manufacturers require various corrosion-inhibiting packaging. This is why Green Packaging stocks a full line of VCI products for your corrosion-prevention needs. Environmentally friendly, easy to use, economical and extremely effective, VCI products are the only choice for corrosion prevention on fabricated metal parts. 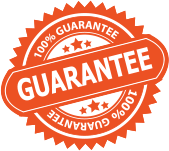 Q: How long does VCI protection work? A: VCI protects metal parts from corrosion for up to three years as long as there is no significant, continuous exchange of air within the enclosure. Q: How does moisture in a package affect the performance of VCI packaging products? A: Some VCI packaging products are produced from low- and high-density polyethylene resins, and they are, to a large extent, resistant to vapor penetration. Some atmospheric moisture will eventually find its way into a closed package. The presence of moisture in a package can be expected during shipments across areas of high humidity. The VCI product still inhibits corrosion despite a low level of moisture passing through the plastic. Q: What can be anticipated when wet parts are packaged in VCI products? A: We always recommend placing clean, dry parts in VCI packaging. If this is impossible, VCI packaging will still protect metal parts from rust, as moisture helps to disassociate the VCI ions. If parts are packaged wet, we always recommend adding a sheet of VCI paper inside the VCI bag to give an even higher level of protection. Q: How long can parts be expected to remain free of corrosion after removal from a VCI package? A: Tests performed with electron scanning (ESCA) microscopy show that two to four hours after a steel test panel is removed from a VCI package, all traces of the corrosion-inhibiting molecular layer are gone from the surface of the part. Q: How long does it take for the interior of a VCI package to reach its designed corrosion-prevention capability? A: The time required for active corrosion-inhibiting molecules from VCI products to saturate a package is a result of the volume and temperature of the package. Protection begins as soon as corrosion-inhibiting molecules reach the metal surfaces, and maximum protection is achieved when the entire environment of the package is saturated with the corrosion-inhibiting molecules. VCI saturation in typical factory environments and in typical packaging applications runs from 12 to 24 hours. 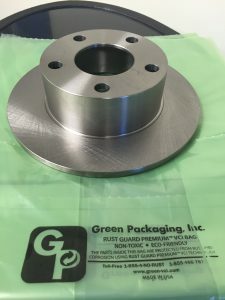 Contact Green Packaging for a full assessment of your corrosion issues and find out the right VCI packaging products to protect your metal parts from rust damage.